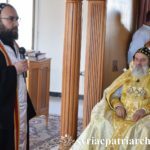 His Holiness Patriarch Mor Ignatius Aphrem II visited Maroutha project and the land on which a new Syriac church will be built. 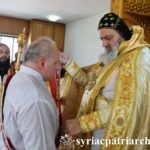 His Holiness was received by His Excellency Dr. Bishr Al-Sabban, Governor of Damascus. 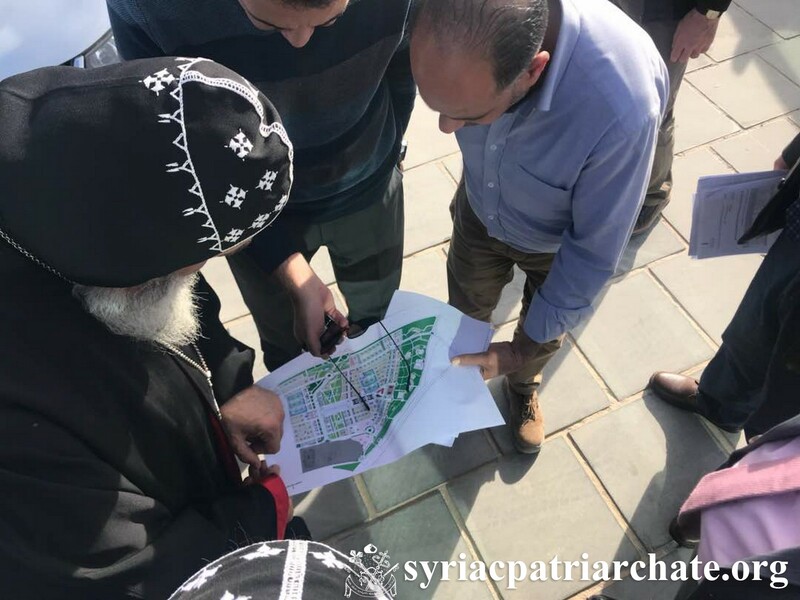 His Holiness inspected the construction work and infrastructure executed by the Governorate of Damascus in Marotha Project. 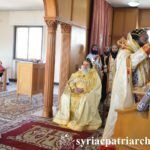 His Holiness was accompanied by His Eminence Mor Timotheos Matta Al-Khoury, Patriarchal Vicar in the Patriarchal Archdiocese of Damascus, and members of the Endowments Committee. 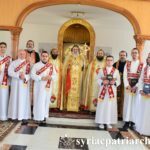 His Holiness Patriarch Mor Ignatius Aphrem II met with a delegation from “World Vision International (WVI)”, at the Patriarchal Residence in Atchaneh, Bikfaya – Lebanon. 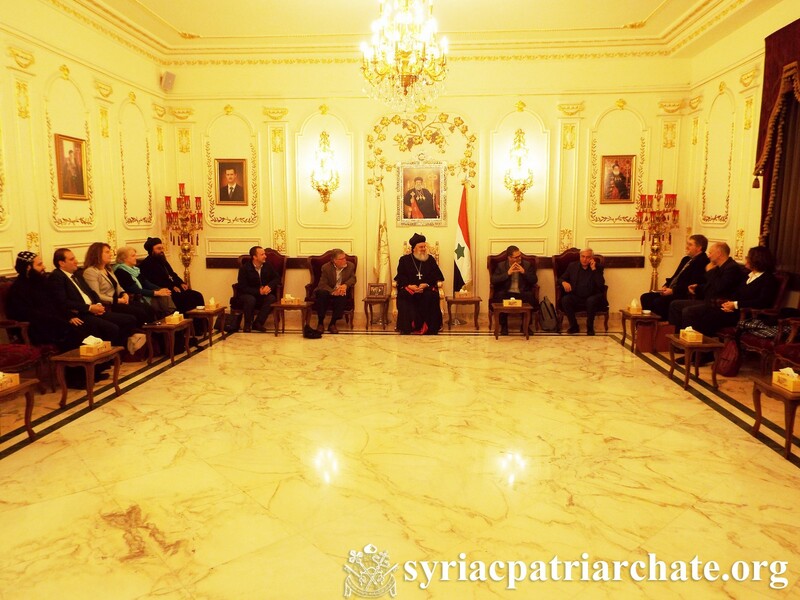 The delegation included Dr. Beng Yeoh, Dr. 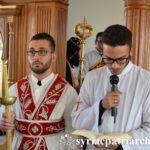 Rein Dekker, and Mr. Wynn Flaten. 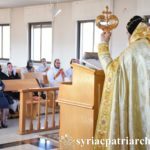 The meeting was attended by His Eminences Mor Timotheos Matta Al-Khoury, Patriarchal Vicar in the Patriarchal Archdiocese of Damascus, Very Rev. 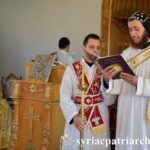 Raban Joseph Bali, Patriarchal Secretary and Media Office Director, and Mr. Shadi Sarweh, Executive Director of St. Ephrem Patriarchal Development Committee (EPDC). 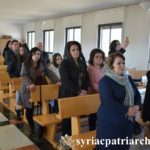 The delegation visited the Patriarchal Residence to meet with representatives of EPDC and discuss matters related to projects executed by WVI and EPDC for the relief of persecuted people in Syria. 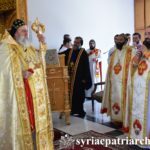 His Holiness blessed the work of the two committees and encouraged them to further develop common work and collaboration. 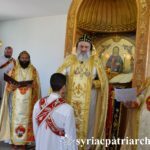 On the occasion of the Feast of Mor Aphrem and Mor Theodoros, His Holiness Patriarch Mor Ignatius Aphrem II celebrated the Holy Qurobo at Mor Aphrem Church in Mor Aphrem Monastery in Maarat Saydnaya. 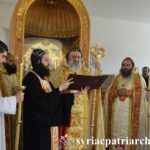 Their Eminences Mor Timotheos Matta Al-Khoury, Patriarchal Vicar of the Patriarchal Archdiocese of Damascus and Mor Timotheos Matthew, Patriarchal Secretary for Indian Affairs assisted His Holiness in the Holy Qurobo. 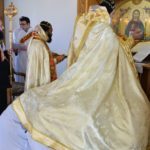 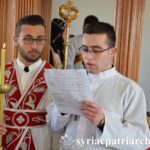 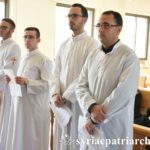 During the Divine Liturgy, His Holiness ordained 4 subdeacons (Malke Karat, Stephan Shabo, Simon Absim, and Rami Alberni) and 4 readers (Basem Dalloul, Elias Munairji, Fadi Abu Asali, and Vinicius Torres). 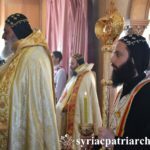 His Holiness spoke about the Mor Theodoros who kept his faith steadfast and was martyred for Christ. 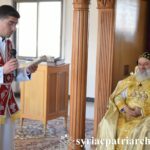 He also talked about Mor Aphrem who was a witness for the Word through his teachings and Hymns, as well as through helping the least fortune and the sick during the plague. 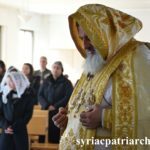 He compared the days when the saint lived to our current times where war is forcing people to leave their homes, and the faith of Christians is tested during persecutions. 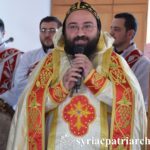 The meeting was attended by His Eminences Mor Timotheos Matta Al-Khoury, Patriarchal Vicar in the Patriarchal Archdiocese of Damascus, Very Rev. 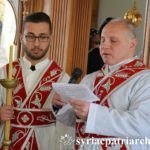 Raban Joseph Bali, Patriarchal Secretary and Media Office Director, and Deacon Imad Syryany. 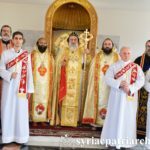 The delegation reported to His Holiness reuslts of their visit to the various Syrian cities. 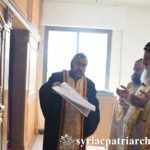 They also reviewed reports on the progress of many humanitarian projects executed by EPDC through the support of the committee. 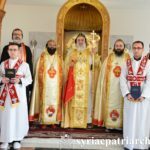 His Holiness welcomed the delegation and expressed his gratitude for the love they are showing to the persecuted people in Syria. 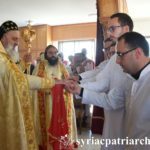 He also blessed the work and collaboration of the MCC and EPDC and encouraged them to further develop common work and collaboration. 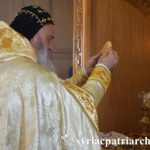 His Holiness Patriarch Mor Ignatius Aphrem II presided over the evening prayer (Ramsho) at St. George Patriarchal Cathedral in Bab Touma, Damascus. 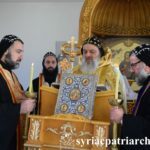 At the end of the prayer, His Holiness prayed the special prayer of Shubqono (Forgiveness) during which the clergy and faithful ask forgiveness from one another, before the beginning of the Great Lent. 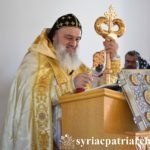 His Holiness spoke about love as a source of true and sincere forgiveness. 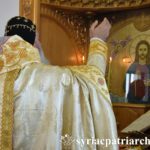 He emphasized the fact that God loved us before for He sent His Only Begotten to reconcile us with Him. 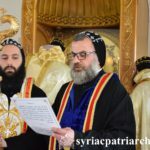 He also spoke about the importance of love and forgiveness at the beginning of the Great Lent, which is a journey of penance and purification of the soul from sins. 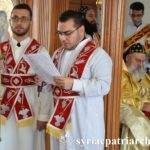 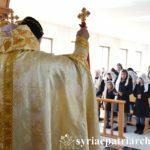 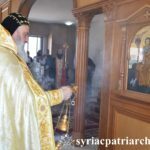 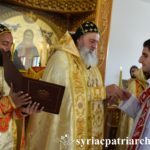 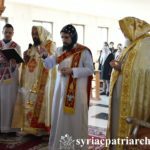 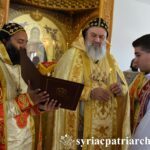 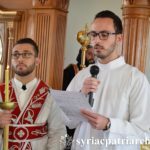 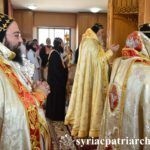 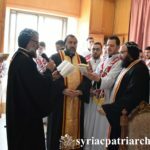 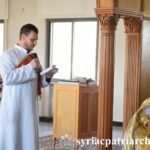 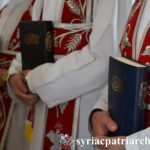 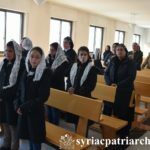 The service was also attended by His Eminence Mor Timotheos Matta Al-Khoury, Patriarchal Vicar for the Patriarchal Archdiocese of Damascus. 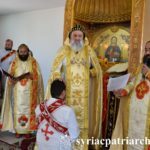 His Holiness Patriarch Mor Ignatius Aphrem II celebrated the Holy Qurobo at St. Georges Patriarchal Cathedral in Bab Touma, Damascus. 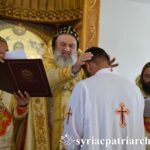 He was assisted by their Eminences: Mor Timotheos Matta Al-Khouri, Patriarchal Vicar for the Patriarchal Archdiocese of Damascus, and Mor Titus Boulos Touza, Apostolic Nuncio to the Evangelical Mission Churches in Brazil, in the presence of clergy from Brazil as well as monks of the Monastery of the Holy Cross, and monks and deacons of the Patriarchate. 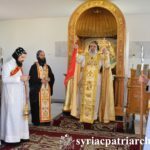 His Excellency Achilles Zaluar, Chargé d’Affaires of the Brazilian Embassy in Damascus also attended the Holy Qurobo. 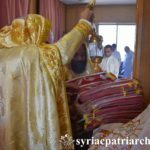 During the Holy Qurobo, His Holiness ordained Very Rev. 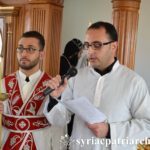 Dayroyo Aphrem Fernandez to be a priest for St. Mary Church in Mor Aphrem Monastery in the Brazilian Capital Brazilia. 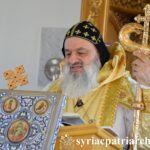 In his sermon, His Holiness explained the Bible reading of the first Sunday of Lent. 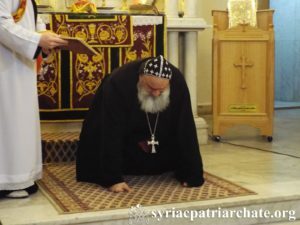 He talked about lent period as a time to plead God to change us like He changed water into wine in Cana. 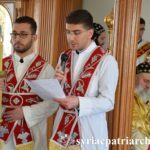 He also spoke about the life of priesthood and congratulated the newly ordained priest, wishing him long years of blessed service. 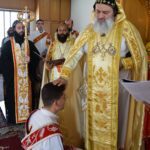 At the end of the ordination rite, His Eminence Mor Titus Boulos Touza wished Raban Aphrem all success in his priestly service. 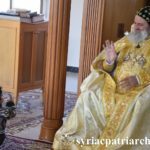 He also thanked His Holiness for his overwhelming fatherly love. 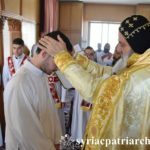 The Patriarchal Encyclical of the Great Lent was then read, after which the newly ordained priest continued the Holy Qurobo. 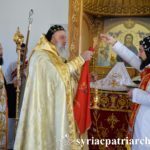 His Holiness Patriarch Mor Ignatius Aphrem II celebrated the Holy Qurobo on the Sunday of all faithful departed, at St. Georges Patriarchal Cathedral in Bab Touma – Damascus. 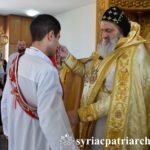 His Eminence Mor Dionysios Jean Kawak helped His Holiness in the Qurobo. 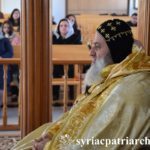 In his sermon, His Holiness spoke about the importance of praying for the dead, and commemorating them, especially during Holy Qurobo. 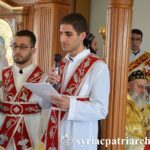 He asked the Lord to make our faithful departed worthy to be with Him in His heavenly kingdom. 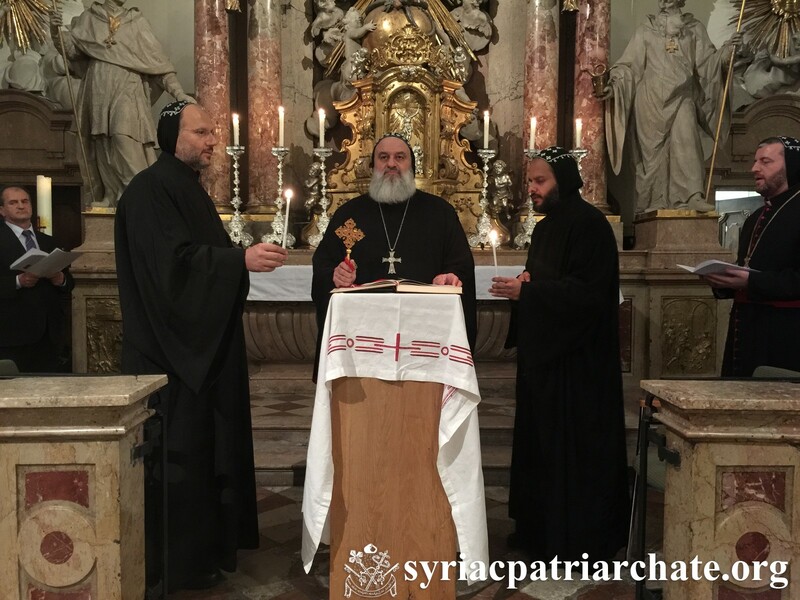 His Holiness Patriarch Mor Ignatius Aphrem II presided over evening (ramsho) prayer at the chapel of the university of Salzburg. 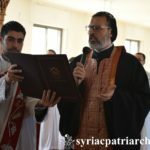 The prayer was attended by His Eminence Mor Polycarpus Augin Aydin, Patriarchal Vicar in Holland, as well as faithful from our church who participated in the inauguration session of “Severus of Antioch and His Search for the Unity of the Church: 1500 Years Commemoration of his Exile in 518 AD” conference. 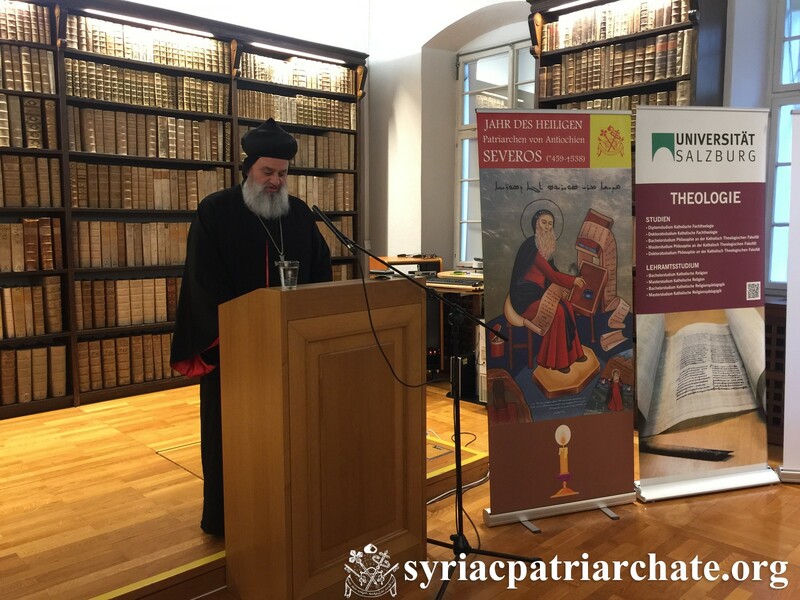 His Holiness Patriarch Mor Ignatius Aphrem II attended the inauguration session of the Conference: “Severus of Antioch and His Search for the Unity of the Church: 1500 Years Commemoration of his Exile in 518 AD”, organized by the Department of Syriac Studies at the University of Salzburg in connection to the commemoration of the 1500th anniversary of St. Severus exile to Egypt. In his opening speech, His Holiness gave an overview about the life and writings of St. Severus of Antioch. 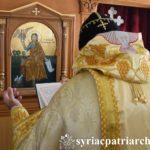 He highlighted the fact that “Despite being away from his flock, enjoying personal safety and comfort, St. Severus did not abandon his mission nor has he forgotten his responsibility towards his flock in Antioch”. 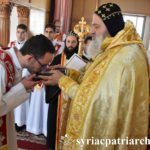 He added that “our saintly Patriarch continued to administer the Church of Antioch from his exile in Egypt for a period of 20 years”. 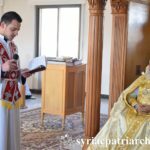 His Holiness also spoke about the great impact that St. Severus left on the liturgical tradition of the Syriac Orthodox Church. 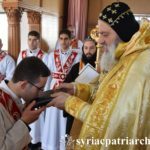 At the end of his speech, His Holiness honored Dr. Sebastian Brock, is celebrating his 80th birthday, with a token of appreciation for dedicating most of his life to the Syriac Studies. 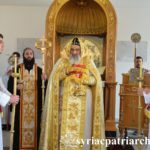 His Holiness wished him and his family good health. 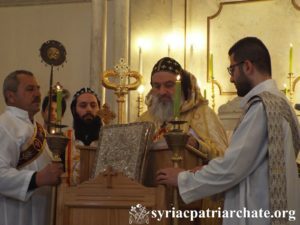 Several speeches were then delivered the inauguration session, which was also attended by His Eminence Mor Polycarpus Augin Aydin, Patriarchal Vicar in Holland, and Mgr. 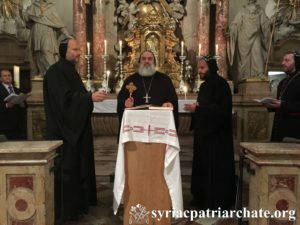 Dr. Franz Lackner, Catholic Archbishop of Salzburg. 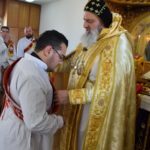 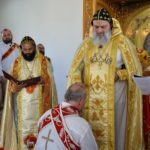 His Holiness Patriarch Mor Ignatius Aphrem II received His Grace Mgr. 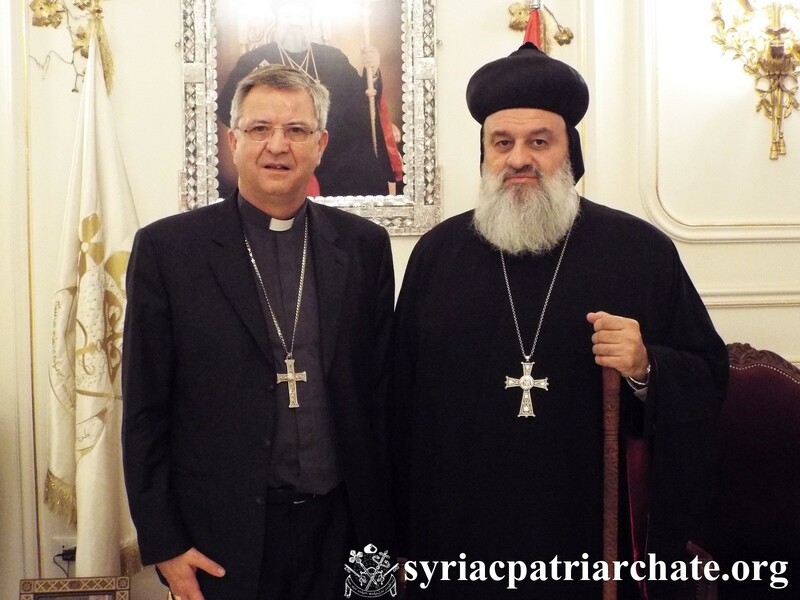 Johan Bonny, Catholic Bishop of Antwerp – Belgium, at the Patriarchate headquarters in Bab Touma – Damascus. 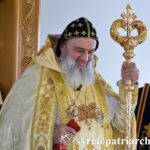 His Holiness discussed with his guest various issues related to the current situation in Syria, as well as ecumenical affairs concerning the relation between churches. 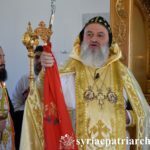 His Eminence Mor Dionysius Jean Kawak, Patriarchal Vicar for the Archdiocese of Eastern United States, and Very Rev. 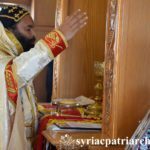 Raban Joseph Bali, patriarchal Secretary and Media Office Director.